Centuries before today's portable technology developed, there existed a portable device of sophisticated technology: the pocket watch. Few of these old-timers exist today with working movements and artful decorative touches intact, but those that remain and their history are worthy of attention by those who cherish antiques and fine engineering. Alan Costa of the National Association of Watch & Clock Collectors (NAWCC) has written an authoritative treatise on the history of watches and states that personal, portable timekeeping devices were not possible until around 1600 with the development of the hairspring also referred to as a balance spring. The hairspring is an invention that keeps the balance wheel swinging at a fixed rate. These developments together led to a timepiece capable of counting minutes as well as hours. Also according to Alan Costa, Peter Henlein, a locksmith, made the first pocket watch in 1524. This was a very bulky affair and actually did not fit in any known pocket at the time. They were worn as a pendant hanging from a chain. A more accurate description would be a "necklace watch". Watch cases were for protection not style, but in the earliest days they often did exhibit some fine design and ornamentation. The watches of the 1600's served more as jewelry than timekeepers as they were not good at keeping accurate time. The year 1675 saw the first watch that was small enough to fit in a pocket. King Charles II of England was the person who set the style across Europe and North America. Glass protective covers were introduced and the pocket watch became a luxurious fashion piece for the few who could afford one. Still, watches made before 1750 lacked accuracy and could lose hours in a single day. From 1750, watches were fitted with a new device - the lever escapement. This improvement allowed the clockmaker to add a minute hand which was not present on earlier watches. Watches now lost only one or two minutes a day. The pocket watch was a European conception and very few of them made their way to North America. European watchmakers did not sign their works making it difficult to put an accurate date on the first pocket watchmaker. The earliest identifiable watchmaker in Europe was a Swiss by the name of Josiah Emery who plied his trade in the late 18th century. Americans in those days who could actually afford portable timekeepers of any variety were apt to own very sturdy, simple English watches. The first American pocket watch was not made until 1809 by the American Watch Company in Waltham Massachusetts, later known as the Waltham company. More extensive manufacturing began around 1850 with watchmakers such as Hamilton, Elgin, and Illinois in America and Alange-Soehne in Europe. Interestingly, the pocket watch predates the ubiquitous wrist watch of today. More modern makers of fine pocket watches include Patek Phillipe, Jules Jurgensen, and Andemars Piguet. 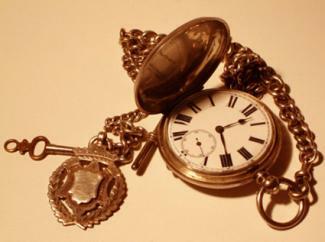 In the antique world, a pocket watch must be at least 75 years old to be considered an antique. There are two main styles of pocket watches - the hunter case and the open-face. Open-face pocket watches have no cover to protect the crystal. Watches like this will normally have a dial at the 12:00 point and a sub-seconds dial at the 6:00 point. 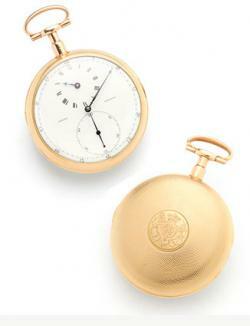 Hunter case pocket watches have a spring-hinged cover that closes on and protects the crystal. Most antique watches will have the hinges located at the 9:00 position. Modern hunter case pocket watches will have the hinge at the 6:00 point with the stem and crown at 12:00. Like the open-face style, the sub-seconds dial will always be at the 6:00 mark. There is also a demi-hunter style with a glass panel on the outer lid so the clock face can be viewed with the cover closed. The invention of this type of case has been attributed to either Wellington or Napoleon. The English claim Wellington; the French, Napoleon. These styles were adorned with enamel, jewels, engraving and many other decorative elements, as well as being totally plain. These are fashion related and are not part of the pocket watch stylistic elements. although they can certainly add value to the piece. Carol Prisant in Antiques Roadshow Primer writes that about 95 percent of watches are not valuable. As the clock and watch Roadshow expert, Jonathan Snellenburg says in the book, "Almost all the watches ever made still survive. Have you ever known anyone to throw a watch away?" Thus decreasing the rarity of the pocket watch and therefore its value. That still leaves five percent of pocket watches that collectors cherish for their many interesting and appealing attributes. The most expensive pocket watch ever sold went for 24 million dollars. It was an antique Patek-Philippe sold by Sotheby's auction house in 2014. Its value was not in the case but in its incredibly complex movement. This is a huge exception to the rule. Most sell for considerably less at auction. When valuing antique pocket watches, condition is always important. Look for scratched or dented crystals and faces, movements damaged beyond repair and missing jewels, stems or wind-up keys. Elaborate painted cases, enameled cases, and those made of gold or set with precious stones are generally more valuable than plain cases, unless the plain pocket watch possesses a fine movement made by an important maker like one listed in the History section above. Gold cases marked 14K, 18K or 750 with the stamp on the inside back cover of the watch are more valuable than unmarked watches. If there is no stamp, it is not gold. Sterling silver pocket watches date from the late seventeenth century. Stainless steel cases were not produced until around 1915. By 1935, silver cases had been almost totally replaced by stainless steel. A pocket watch with a sterling silver case is rare and valuable. Key-wound watches are usually older than stem-wound watches and are more valuable. Nineteenth and twentieth century pocket watches have jewels, real or not, set into the movement to allow the gears to run more smoothly. Such watches are more highly crafted and therefore more valuable than the same watch without the jewels. A fully jeweled movement will have 17 jewels. The weight of a pocket watch may indicate that it has a sophisticated movement or a case of sold gold. Any heavy pocket watch is worth a thorough investigation. Some early pocket watches had two nested cases, often of different materials. There may be a tough tortoiseshell on the outside case with a silver case within. Also, sometimes the inner case was plain while the outer case was elaborately decorated. Since the early seventeenth century, enameled watch cases were a specialty of Geneva watchmakers. They remained popular in the eighteenth century and often included classical figures or landscapes surrounded by pearls. The cases and movements could very well be made in different countries and put together by a watchmaker, notes Prisant in the Primer (pp 198-200). Serious collectors will look for estate sales, auctions and antique dealers. They are also sold on eBay and online auctions, but the buyer must be very well informed on the seller and the subject. Stephen Bogoff, an American expert in antique pocket watches who has been in the auction business since 1970, is one of the few reliable online sources where one can educate themselves on the current market as well as view the various ages and styles. In Europe, Barnebys, originally of the United Kingdom, is fairly new but is a trusted global auction site for watches, antiques in general, and fine art. These collectors are to be admired for their profound interest in a very complicated piece of engineering - a piece both practical and often a work of art. 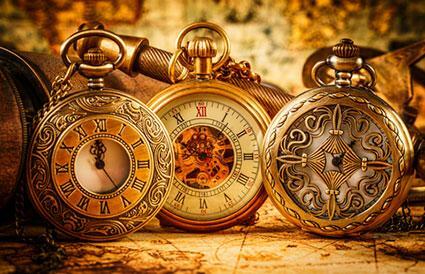 The fact that there are few genuine antique pocket watches in existence keeps the avid collector continuously searching for and learning about these rare treasures.